I would like to invite you join me for lunch on Thursday, August 2. As is the case on each first Thursday of the month, Central Dallas Ministries will host its "Urban Engagement Book Club" again this week. We've been doing this every month for three years now. At each meeting we discuss a book relating to poverty, justice, community and economic development or some other topic that strikes close to the heart of our work, and thus, of our concerns. Our August meeting will be a bit unique. Simply put: We don't normally do theology! As a matter of fact, we've never done serious theology... until now! Consider this your personal invitation to join me at noon this Thursday in Room 386 of the Highland Park United Methodist Church, our hosts. For more information, please visit http://www.urbanengagement.org/. 1) I'll buy your lunch--it won't be too elaborate, but the heart will be in it! 2) You will hear our friend Randy Mayeux share an extremely helpful synopsis-no need to read the book beforehand-of James Cone's classic volume, God of the Oppressed. 3) Following the "content dump," we'll wrestle over the message in a time of profitable conversation. This "follow on" time, as we call it, will be facilitated by Rev. Gerald Britt and Rev. E. D. Charles, both seasoned inner-city leaders and community developers! 4) You'll be out and on your way--unless you want to hang around and talk more-no later than 1:15 p.m.
You can help us prepare for lunch by sending your RSVP to Lisa Goolsby (at 214-823-8710 ext. 138 or lgoolsby@CentralDallasMinistries.org) right now! Spread the word among your friends, associates and anyone else interested in doing theology! Hope to see you on August 2. Living in my inner city neighborhood feels a lot like a small town. It reminds me of my childhood in, what was then, small town Richardson, population about 1,200. No matter where I go around here, I run into people I know and who know me. Saturday evening, I stopped at the Chevron station at Carroll and Live Oak. As I filled my car's gas tank, Buford approached me intending to ask if he could wash my windows in exchange for pocket change. As he approached with squeegee in hand, he recognized me. "Well, hey there, Preacher," he said, as if that were my name, with a sense of relief that he knew me and that I knew him. "How you been?" Before I could answer, he broke into a conversation about the Central Dallas Church and its move and how he had not been able to find it. I reminded him again, as I had the last time we talked, of its new location. I asked him if he was ever going to get off the streets. He just hung and shook his head, all in one motion. I'd really like to help you," I told him. "I'm going to give you some money and you're gonna go buy some food and a drink, or whatever," I continued. "But, I know that doesn't really help you!" "Hey, Preacher, I'm going to have a beer before the nights over," he explained, "but, I won't use your money for the beer." "I don't care if you buy a beer with my money," I told him, to his surprise, "All I care about is seeing you get off this street. I like you and I know you like me. Right?" I asked. "Yeah, thanks, sure, right," he replied with a big smile, as he crossed himself and touched his heart with both hands, his street version of the sign of the cross. So, why do you stay out here?" I pressed him. He hung his head again. I told him about apartments we now have available for him and others like him. I explained what he needed to do to get one. "I can work for it, Preacher," he offered with some new enthusiasm. His quick assurance reminded me that everyone, almost, wants to work for what they receive. Everyone maintains some measure of pride and self-respect no matter what their baggage. "Just come by my office next week and let's get you into one," I urged him. As we talked, a realization swept over me. He was my neighbor and my friend, and he regarded me the same. He just wanted to talk. He didn't want me to leave. He needed my friendship. We talked for a long time before I had to leave. If we have a chance of changing things for him, it resides in this reality. For years I've been trying to help him move off the streets. For years it hasn't happened. He told me that his companion of many years, Darlene, had passed away. Darlene, a haggard woman who lived the last of years of her life in a wheelchair that he pushed everywhere, had meant everything to Buford. "I miss her a lot," he shared. "I'm really sorry," I told him. When he sensed that I had to go, he threw his arms around me and gave me a big bear hug. He wished me well and said he'd come by to talk some more. Being in the same neighborhood makes us neighbors. I'm hoping that we can find a way together to get him into an apartment he can call home. He deserves better than camping on the streets of our small part of this huge city. Driving away, I realized that Buford only wants what I want: to be loved, to matter to someone and to be heard and understood. James Montgomery wrote his hymn, Hail to the Lord's Anointed, in December 1821. Obviously not privy to the ideology of 20th century liberationists, Montgomery understood the message of Jesus and the ancient church. We sang his song last week in church. Montgomery's hymn was his interpretation of Psalm 72, a tribute to and job description for the reigning king and ultimate political figure in Israel. We would do well to spend time reflecting on the message of both hymn and ancient psalm, especially as we consider the place of church and government in the nation's life and circumstance. Last Tuesday, after twenty years in the game, Houston Astros second baseman, Craig Biggio announced his retirement at the end of this season. His speech was filled with uncharacteristic emotion, even tears. He thanked everyone on his long list, but the heart of his statement was all about his family and about getting to be more involved with them. The articles that filled the Houston Chronicle last Wednesday morning are all worth reading (http://www.chron.com/), actually whether you love the game or not. "B-G-O," as the Houston fans shout to him during home games, has been a special player--a cornerstone talent with a giant work ethic and a heart to more than match. In a day when the NBA is in turmoil thanks to a basketball official shaves points to cover bets, a professional football star gets caught up in a cruel dog fighting enterprise, and lots of other baseball stars "jack up" their game with the help of steroids, Biggio represents the best of professional sports--a very different sort of player. No wonder the fans love him. Tuesday night was incredible--that's how it turned out--just incredible. Coming to back in the bottom of the sixth inning, with two outs, the bases loaded and tied with the Los Angeles Dodgers 3-3, Biggio ripped the first pitch from right-hander Rudy Seanez six rows up into the left field seats, known as Crawford Boxes. Talk about a magic moment. From now on when people ask why I love baseball so much, I will tell them this story. It's what the game is all about--moments like last Tuesday evening. . .and the twenty years leading up to it. He called me a couple of days ago. Somehow he had found his way to this page and to my posts on immigration. 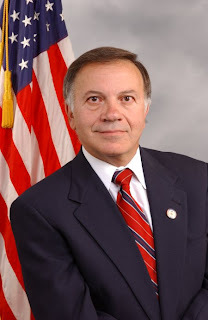 More particularly, he was intrigued by our discussion of the "Dream Act," pending legislation that would open a way for the undocumented children of undocumented immigrants to remain in the United States so long as they continued their education or joined the U. S. Armed Forces and exhibited the traits of "good moral character." He seemed eager to tell his story and that of his family. He had three children, all of whom came to the U. S. years ago when he and his wife over-stayed their work permits. They had lived without proper documentation for well over a decade. His oldest son is a graduate of Texas A & M University, but cannot work because he has no documentation. The other two children are great students, the youngest he characterized as "the smartest of all." "I don't want my children to have to live like I have. I tell them that they are living in paradise without the ability to really be involved," he said. Obviously, he was wanting to see the Dream Act passed into law so that his children could stay in the country and make their contributions to our national life. Talking to him a couple of realizations washed over me. First, the responsibility for the situation facing this man and his family is his, but only in part. All along the way in his American journey, opportunity after opportunity to apprehend, detain and deport this family were not just missed, they were intentionally ignored by employers and various federal officials. This man and his family were allowed--better, they were encouraged--to stay, to work and to contribute. Second, why on earth would we not want a man and a family like this one to stay in our country? We need the Dream Act and we need comprehensive immigration reform. Surely we are smart enough to ignore the hatred and just do the right thing for everyone involved. Below is a letter from my friend, Kariteaa, a young man who has been involved with our Transition Resource Action Center (TRAC), a one-stop shop for youth who "age out" of foster care at age 18. I encourage you to read his letter, and then to hear his story in the attached video. To watch the video in full screen, click here. My name is Kartieaa, and I entered the foster care system at age 12 after my adoptive parents died in a car accident. I was moved through 11 homes and wound up in jail before “aging out” of the foster care system at 18. I had no one to turn to and no place to live – until I got connected with Central Dallas Ministries’ Transition Resource Action Center (TRAC). Now I have an apartment, a job and am taking classes at El Centro College. Without your support of TRAC, I would probably be on the streets or back in jail. Thank you for re-writing my future. To see more videos about your neighbors, click here. 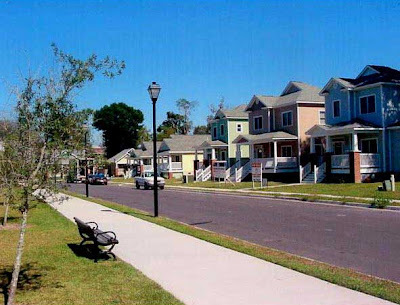 Restoring city streets with dwellings. . .
For the past two days I've been in Houston, Texas attending the Supportive Housing Institute Texas, sponsored by the Corporation for Supportive Housing (CSH), one of our best national partners. I found myself pretty well sequestered in a conference room with about 35 people who devote themselves to the enterprise of developing permanent supportive housing for very low-income residents of Austin, Dallas, Fort Worth and Houston. I mean, think about trying to pull housing out of the ground from, from, well, often from seemingly nothing. . .for a living! We've now spent four days over the past five weeks working on the design of a new housing development plan. It has been beneficial to be away and to be forced to focus on the planning. As I listened and watched and learned, I realized that I was seated in a group of dedicated, highly creative, extremely hard-working, largely unsung housing providers for some of the weakest and most fragile citizens among us. My other impression--not a new one, actually--was the recognition of just how hard these projects are to pull off. No one in that little hotel conference room would ever dream of giving up. My mind drifted to a very old text from Isaiah. Something about the people of God being known as "restorers of streets with dwellings" (58:12). Glad to be among these folks. Grateful to CSH for pulling the Institute together. We will conclude come September with three more days together in Austin. Facing the reality of 9,000,000 uninsured children in the United States turns out to be sobering work. "Red Tape and Bureaucracy in Health Care" (June 10) http://abcnews.go.com/Video/playerIndex?id=3264531. Don't know about you, but I found last night's Presidential debate on CNN among the Democratic candidates using the YouTube question format to be interesting and refreshing compared to previous debates. Ordinary folks asking the questions that concerned them. Opinion: there would have been many more questions on the Iraq War if the U. S. "recruited" its soldiers from a national draft. Funny how current, pressing self-interest shapes our primary concerns, huh? I find it to be the same with the issues associated with poverty, like the video above. Today, again, I am asking you to personalize the letter below and FAX it today to your two U. S. Senators. Then, drop your letter in the mail. You will find all the information you need to contact your Senators embedded in the attached letter. The Dream Act needs to be voted on and passed by the U. S. Congress. This effort today targets the U. S. Senate. This legislation will provide legal status to the children of undocumented immigrants who brought their children to the U. S. years ago when they were very young. Most of these children have been in the U. S. for much longer than 5 years. Our country is the only home most have ever really known. 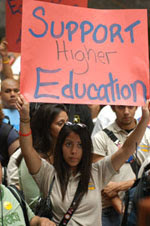 The Dream Act would provide temporary legal status to any child of undocumented immigrants who 1) completes high school or its equivalent, 2) enrolls in a two or four-year institution of higher education and/or 3) enlists in the U. S. Armed Forces and 4) has displayed good moral character while living in the U. S.—in other words, no criminal activity. These young people would be granted legal status and would no longer live in fear of deportation. Our nation has already made a serious investment in the lives of the vast majority of these students who have been educated in our schools. What a benefit to our nation to see them stay here and complete their education and possibly seek citizenship in the U. S. after the completion of college. Please help me by taking action today! Call me if you have questions. Please lend your immediate and determined support to the Development, Relief and Education for Alien Minors Act (DREAM Act). As you are aware, this bill has been in discussion in the Congress for the past several years. It was included as a part of the Comprehensive Immigration Reform Act of 2006 that recently failed before the Congress. This piece of legislation deserves to be considered as soon as possible by the entire Senate. The children of undocumented aliens, brought to the United States by their parents years ago, who have displayed high moral character and who desire to continue their formal education beyond high school or who desire to enter the U. S. Armed Forces deserve the protection and advantages of being given legal status so that they can remain in the United States without fear of deportation. Currently, there is continuing and growing interest in attaching the bill to some other legislation so that it can be voted on and hopefully enacted on its own merits. Please urge your colleagues in the U. S. Senate to act on this matter as soon as possible. If you have the time, leave a post here reporting on when you sent your letter and from what state. Mark Salzman spent a year teaching young men how to write. His students were extraordinary. Each was locked up in a juvenile prison. Most had created very serious crimes. Many were convicted murderers. One result of his work turned out to be the book he wrote reporting on his own experience with the young men and sharing the words they recorded in their own notebooks as he taught them. True Notebooks: A Writer's Year at Juvenile Hall (2003) is worth a read. Randy Mayeux provided a moving synopsis of the book during the July meeting of our Urban Engagement Book Club. The group meets at noon on the first Thursday of every month, rain or shine, to discuss some important book related to the work we are attempting in urban Dallas. The book is composed largely of the essays of the students. If you want to experience the thoughts of children without options who continue to display real soul, read this book. In reflecting on the book, it occurred to me again that far too often we tend to judge and regard people from a-single-point-in-time perspective. The fact is these kids grew up with neglect, poverty, abuse and abandonment. Their life stories, their histories ushered them through very bad choices and into juvenile hall. In my case, I grew up with attention, guidance, abundance, love and discipline. My life story, my history has ushered me through mostly good choices (thanks to all the people constantly watching and "getting my back" and sometimes my back end!) and into a satisfying and mostly productive life. For some reason I know that, at the soul level, my journal or notebook probably reads a lot like the ones they composed. The life and circumstantial outcomes have been much different. But, one thing is very clear to me: I can't sit in judgment, nor can I claim any credit for my own good fortune. This is a good thing to remember. CNN has come up with a new to-the-people format for two coming Presidential debates. On next Monday, July 23, Democratic candidates for President will engage in what will undoubtedly be a very lively debate. Questions will come directly from people all across the nation via the interesting media provided by YouTube! Ordinary people post their questions with all the charm, particularity, creativity and passion that YouTube video can deliver. Questions will cover all the hot and, possibly, not so hot topics of the day: Iraq, health care, Katrina, international relief, religion, civil liberties and rights, gay marriage, abortion, Israel, Darfur and many others. Truth be known, I bet these candidates hate this form of debate! Talk about no ability to control the discussion. Likely just what we need. 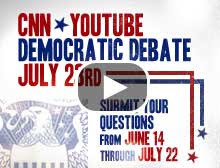 WASHINGTON (CNN) – Get your first glimpse at some of the YouTube submissions for July’s CNN-YouTube Democratic presidential debate – the first in history to be driven by user-generated video questions. Click here to view the latest submissions and add yours. CNN and YouTube’s live forum will feature video questions submitted to YouTube and answered by Democratic and Republican candidates live on CNN. CNN’s Anderson Cooper will moderate the two two-hour debates and pose follow-up questions. The Democratic debate, the first Democratic National Committee-sanctioned presidential forum of the 2008 election cycle, will be held at the Citadel in Charleston, South Carolina, on Monday, July 23, at and will air live on CNN. The Republican presidential forum hosted by CNN and YouTube will take place on Monday, Sept 17, in Florida. Questions for the Democratic Debate can be submitted until July 22. It will be much like a national town hall meeting of sorts. Very interesting format for people just like you and me and many of our friends. What do you think about it? I'd love to hear your reaction. It is still not too late to get your question in! "Intentional ministry to the poor"
A couple of days ago, "Carlton" posted what follows (black font) in the comments section of one of my posts. Sorry to change the subject but Jeremy from Central Dallas Ministries suggested I bring my concerns to this blog community that cares about the plight of the poor and oppressed. Glad you did! And, I'm glad Jeremy directed you to us. I expect that many readers here will have better advice for you than I will. I hope everyone with a point of view will join the conversation, Carlton. Thanks for engaging us in this way! I need wisdom and advice. Who doesn't! I know I certainly do. A good place for us all to begin, as well as to return again and again, is to this point of realization: we are not alone! I'm a young preacher in a small Church in New Mexico. We have a large population of poor and over the last several weeks I have been working closely with some homeless individuals. It sounds like you are responding to the people around you in a positive manner. For a minister with a heart for taking seriously the words of Jesus about the poor, this is the only place to begin. As a leader, you must be willing to befriend, with a heavy emphasis here on "friend," the poor who live near you and your congregation. Your leadership and heart connection will be key in mobilizing your church. When you tell me that you "have been working closely" with folks in difficult situations, you tell me that you are on the right track. Direction is almost always more important than details. The details change with each person and situation. The basic direction of your ministry and leadership must not. Every situation is so different, and our city has little-to-none to offer the homeless and poor. By making this statement, you tell me that you are getting to know, really know the people with whom you are working. This is a very good indication that you are taking each person seriously and that you are giving your time up to their stories and dilemmas. Again, essential to any progress for you, the poor with whom you are working and your church. As far as city resources, your experience is the experience of people who are concerned all across this nation. That said, I expect there are more resources than you realize. Have you talked to anyone at City Hall? How about the county? I recommend that you go and meet the leaders of your community, people like the mayor and city council members, the city manager, the county judge and others. Is there a hospital in your town? Go talk to the Emergency Room doctors and the hospital administrator to understand their challenges--they have some of the same ones you are running into, I promise you. Are there charitable organizations in your community? How about civic clubs, like Rotary, Lions, Kiwanis? What about student service groups in your public schools? Is there a ministerial alliance in town? What are other churches doing? Can you find out? Do you have a local newspaper? Could you submit an Op-Ed piece for publication that would point out what you are seeing to raise awareness and help "flush out" others who share your concerns? I'm at a loss on how best to act redemptively in the lives of these individuals and how best to lead a congregation into intentional ministry to the poor and homeless. I understand your feelings here, big time! Here's what I am learning. 1) Don't just do something, stand there. In other words, continue to listen to the poor in your community. Talk with them about both their needs and their assets. Everyone has assets of some sort. The poor can contribute to whatever solutions and strategies you develop, but they need to be in on the ground floor of the process. Ask the homeless what they think should happen in your city. What are their concerns, their assessment of the needs? Once you hear what they would like to see and to help happen, begin to do "asset mapping" to really understand what is available to you. Take some of them with you to meet with leaders so that their stories can be shared with a wider audience. In general leave all of the "redemptive" functions to God. You and your people need to focus on keeping your feet firmly on the ground and just love people, no conditions, no strings attached. 2) Don't just stand there, do something! After listening or, better, as you listen, begin to act. Never under estimate the importance of your own action, even if no one else from your church joins you as your begin. Attempt to draw others into your vision by creating a small group, possibly in your home, to discuss the issues and the situations. Share your own theological basis for being concerned in this setting of supporters. Don't limit yourself to your own church. Receive anyone who shares your vision and values. 3) Teach your church the values you are discovering in scripture regarding the poor, justice and what it means to be a neighbor and disciple. That will give you enough material for the next 20 years or so! I've read most of Ruby Payne's info which has been very helpful but I need practical advice on how to work within or around the system to best help many of these individuals. What resources would you recommend that would be helpful in understanding how to practically and purposefully help those broken by poverty and homelessness. Ruby Payne's controversial book is helpful to a point. One problem I have with it is its stereotyping paradigm. If you take what she writes as gospel, you will expect all poor folks to be the same and respond the same. Then remember, she writes primarily with public schools in mind. Go beyond what you can learn from her. Check out Building Communities from the Inside Out, by McKnight and Kretzmann of Northwestern University. I refer to it as the "green book" or the "bible of community development." Read John Perkins' classic, Beyond Charity, a primer on Christian community development. Visit the website of the Christian Community Development Association (CCDA), an organization that Dr. Perkins helped found years ago. This is a group you need to know about. Try to attend their annual conference this fall (usually in October). You will meet a couple of thousand people who share your concern and who are leading organizations that are attempting what you dream of. Most will be from urban areas, but not all and there will be much to learn. Read David Shipler's new classic Working Poor: Invisible in America. Send me your mailing address and I'll send you a copy, I have several. Plug into Jim Wallis' Call to Renewal and Sojourners organizations. Read Shane Claiborne, Gustavo Gutierrez, Dallas Willard and Bruce McLaren. Plan a trip to Dallas and spend a couple of days with us. We can learn from one another. You can email me at charlton@grantscofc.org. Thanks. I'll send you this by email, as well, Charlton. Let's keep the conversation going here. I look forward to reading what others share. Whatever you do, keep at it. Over the past 13 years I have learned that 95% of just about everything is a matter of simply "showing up" and not going away. Let's stay in touch! And again, thanks for the post! One more thing, Carlton, take a look at this site: http://www.city-data.com/city/Grants-New-Mexico.html. Help us pass the Dream Act! Last Monday morning, we accompanied our friend Jose to Immigration Court here in Dallas, Texas. Fortunately, the judge granted a continuance for his deportation case to November 5, 2007. As we left the Federal Courthouse, Jose's attorney told us, "We've got to get the Dream Act passed. It is Jose's most realistic chance to avoid deportation." Please help me by standing with Jose and Monica and millions of other promising young people who were brought to the United States by parents years ago when they were only children. Jose and Monica want to go on to college and they want to do so with the proper documentation. Please help me by reading on. . . .
Background to the "American Dream Act"
Every year, U.S. high schools graduate approximately 65,000 immigrant students. Brought to this country as young children, they have grown up in American K-12 schools and share our culture and values. Like their U.S.-born peers, they dream of pursuing higher education. Unfortunately, due to their immigration status, they are barred from the opportunities that make a college education affordable – in-state tuition rates, state and federal grants and loans, most private scholarships, and the ability to legally work their way through college. In effect, they are denied the opportunity to share in the American Dream. If passed, the “Development, Relief, and Education for Alien Minors Act,” S. 774, a bipartisan federal proposal led by Senators Richard Durbin (D-IL), Chuck Hagel (R-NE), and Richard Lugar (R-IN), would facilitate access to college for immigrant students in the U.S. by restoring states’ rights to offer in-state tuition to immigrant students residing in their state. and Lucille Roybal-Allard (D-CA) introduced a similar proposal, the “American Dream Act,” H.R. 1275, in the U.S. House of Representatives. Age. Immigrant students must have entered the U.S. before age 16. Academic requirement. Students must have been accepted for admission into a two or four-year institution of higher education or have earned a high school diploma or a general educational development (GED) certificate at the time of application for relief. Long-term U.S. residence. Students must reside in the U.S. when the law is enacted. In addition, those eligible must have lived in the U.S. for at least five years preceding the date of enactment of the Act. Good moral character. Immigrant students must demonstrate good moral character, a defined term in immigration law. In general, students must have no criminal record. Served in the U.S. Armed Forces for at least two years and, if discharged, received an honorable discharge. The “DREAM Act” and “American Dream Act” provide work authorization and protection from deportation for students ages 12 and older. Students who are at least 12 years old, enrolled full-time in primary or secondary school, and have met all the requirements for conditional permanent legal resident status, except for high school graduation, will be eligible for protection from deportation and granted work authorization. America rewards hard work. Students in America know that by studying and achieving success in high school, they can potentially earn the reward of a college education and truly fulfill their potential. The American way is to offer equal opportunities to all and encourage all to make the most of their talents. Current law punishes children for a decision that they did not make. America cannot continue to penalize young people who have lived in the U.S. since they were children. These individuals were brought to the U.S. as very young children and are not to blame for their lack of documentation. They have done nothing wrong and should not be punished. These children are Americans. Granting access to the “American Dream” for kids who have grown up reciting the Pledge of Allegiance, playing baseball, and eating apple pie is the right thing to do. They have sat alongside our children in the classroom. They share American values and traditions. This country is their home. There is a significant cost to our nation in denying these children a college education. We have already made a significant investment in their K-12 education. We risk an enormous cost by cutting their education short and not reaping the full potential of our investment. There is no benefit to this nation in leaving this segment of the population undereducated and thereby relegated to second-class citizenship and low-paying jobs insufficient for supporting a family. This week, Senators Richard Durbin (D-IL), Chuck Hagel (R-NE), and Richard Lugar (R-IN) will introduce the "Development, Relief, and Education for Alien Minors (DREAM) Act" as an amendment to H.R. 1585, the Department of Defense authorization bill, which is now being debated in the Senate. The provisions of the DREAM Act amendment are expected to be identical to S. 774, the stand-alone "DREAM Act" bill that Senators Durbin, Hagel, and Lugar introduced earlier this spring. The amendment will need 60 votes to pass. Its adoption would be a giant step forward for the DREAM Act, which would then stand an excellent chance of becoming law this year. We do not yet know when the vote will be, and it is possible that procedural obstacles could prevent one from occurring at all. But regardless, it is imperative for all DREAM Act supporters to call your Senators and send an e-mail message to them today, and again tomorrow, and again every day until the vote occurs. You can find your Senators' phone numbers and email addresses here. In the case of Texas Senators, a phone call is the easiest way to take action now. Please act now for Jose and Monica! Late breaking update: I spoke with staff in Senator John Cornyn's office this evening. The Defense Authorization Bill was pulled from the floor this afternoon. There is interest in attaching the Dream Act to an education bill up for consideration at this time. The staff person I spoke with told me that Sen. Cornyn would not oppose the Dream Act, but that he likely would not actively promote it either. Unfortunate. Still, we need to call, email, write, FAX and get the message to all of our Senators, wherever we live, to support the passage of this bill that would benefit immigrant children. "Few of their children in the country learn English. . . .The signs of our streets have inscriptions in both languages. . . . Unless the stream of their importation could be turned they will soon so outnumber us that all the advantages we have will not be able to preserve our language, and even our government will become precarious." If you selected "D," you are correct. 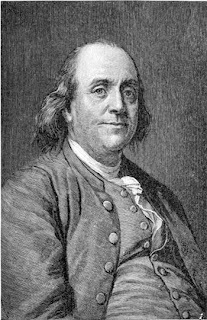 Franklin spoke disparagingly of the German immigrants of the 1750s. Some things never change in this country. 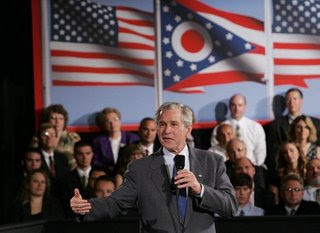 On Tuesday, July 10, President Bush addressed a crowd in Cleveland, Ohio at the Intercontinental Hotel Cleveland. The White House website characterized the address as a call "on Congress to Act to fund Vital Priorities" (see the link to the site and the text of the entire speech--bottom of this post). “Let me talk about health care, since it's fresh on my mind. The objective has got to be to make sure America is the best place in the world to get health care, that we're the most innovative country, that we encourage doctors to stay in practice, that we are robust in the funding of research, and that patients get good, quality care at a reasonable cost. The immediate goal is to make sure there are more people on private insurance plans. I mean, people have access to health care in America. After all, you just go to an emergency room” [emphasis mine, LJ]. In his speech, the President goes on to argue against expanding almost any version of our public health care system that might eventually lead to a comprehensive, national health coverage plan, including coverage for children just above the national poverty line. This is understandable given his political ideology. Now, we can legitimately debate the particulars of universal coverage and how to achieve that goal. The President's comments in the speech provide several "jumping off" points for such a debate. I respect the fact that the subject is complex and that numerous special interests are involved and have combined to make the entire issue a political quagmire for everyone. Future posts here will likely get at some of those issues and points for debate, as have several of my previous posts. For today though, my attention is riveted on the remark the President made that actually reveals his perspective on what health care actually means, what it entails. I expect that any physician, hospital administrator or public health official who heard that statement must have been shocked, stunned, terrified and thoroughly amazed all at once! For the President of the United States to equate health care with a visit to an emergency room demonstrates just how serious our national public health crisis really is. No wonder we are now spending over 15% of our annual Gross Domestic Product on health care related costs, while achieving so little return on our investment in quality public health outcomes when compared to other industrialized nations. One of the President's major concerns as expressed later in the Cleveland address is how to best use our funds to achieve the maximum in public health quality and benefit. How such a concern squares with his placing the ERs of America in the default position for the nation's uninsured escapes me. Everyone knows that the emergency department is one of the most expensive health care venues available and is designed to be a station of last resort, or the first stop in an acute emergency situation. Scroll back on this site to just last Thursday, July 12 ("A Medical Home"). That brief essay pointed out the extremely positive impact of a reliable medical home on minority health outcomes and clearly documented racially informed disparities. In the same speech in Cleveland, the President vowed to veto a bipartisan plan to expand the Children's Health Insurance Program to more adequately care for the health of all of America's children. Members of his own party expressed shock at his threat, given the fact that the President had not had a chance to review the legislation. But, in my view, we can trace it all back to the simple-minded misconception that everyone already has health care. I mean, after all, anyone can go to the emergency room when they need to see a doctor. Small victory for Jose. . . Since many are asking, I thought I'd go ahead and provide an update on Jose (see post earlier this morning below). The Court granted a continuance to Jose and his attorney so that adequate preparation can be made to seek relief for him in the deportation proceedings filed against him. 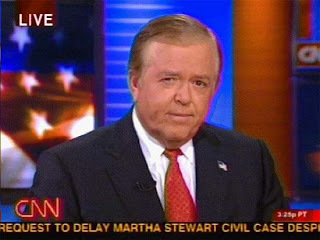 He will be required to appear again on November 5, 2007. Between now than then, we intend to mount a letter-writing campaign to every member of the U. S. House of Representatives and the U. S. Senate seeking passage of "The Dream Act." This legislation could provide relief to the children of undocumented immigrants by allowing them to remain in the country with the documents they need. The only requirement would be that they are enrolled in higher education or join the U. S. military and continue to demonstrate standards of high character. I hope you will join me today by writing your U. S. Senators and your Representative. When you write, you could help our campaign by forwarding on to me a copy of your letters. You may email letters to me at ljames@CentralDallasMinistries.org and/or mail them to me at Central Dallas Ministries, P. O. Box 710385, Dallas, Texas 75371-0385. Thanks for your concern and your prayers. Now, we need your action! This morning at 9:00 a.m. I, and several other people, will be sitting in the Dallas Immigration Court located in the federal courthouse at 1100 Commerce Street, Room 404. We'll all be there for one reason: Jose, our friend. Jose is a bright, 18-year-old young man whose always been a good guy. Never caused his parents any problems at all. Just finished high school. No drugs. No drinking. No gangs. No violence. No trouble with anyone. Jose came to the United States as a much younger boy. His parents brought him here when they came from Mexico. They, like millions of others, came without proper documentation. They came to work, and they found jobs, plenty of work to do here. They came for a better life. No one stopped them. Lots of people hired them. They built a life in Dallas. Today Jose appears before the Immigration Court. He will be represented by an able attorney. Our prayer list this morning includes three items: We are all hoping and praying that the judge will be lenient and delay any decision on Jose for several weeks or months. Second, we are praying that the immigration prosecutor will exercise his/her administrative discretion, dismiss the charges and let the case die. Third, we are working hard to convince the U. S. Congress to pass some version of "The Dream Act" that would provide protection for young people and children who have been in the country for many years, who have displayed good character and who want to continue their eduction. Please remember Jose this morning. Remember his parents and his entire family. Remember the judge. More from Gustavo Gutierrez on "action"
". . .the rediscovery of the eschatological dimension in theology has also led us to consider the central role of historical praxis. Indeed, if human history is above all else and opening to the future, then it is a task, a political occupation, through which we orient and open ourselves to the gift which gives history its transcendent meaning: the full and definitive encounter with the Lord and with other humans. "To do the truth," as the Gospel says, thus acquires a precise and concrete meaning in terms of the importance of action in Christian life. Faith in a God who loves us and calls us to the gift of full communion with God and fellowship with others not only is not foreign to the transformation of the world; it leads necessarily to the building up of that fellowship and communion in history. Moreover, only by doing this truth will our faith be "verified," in the etymological sense of the word. From this notion has recently been derived the term orthopraxis, which still disturbs the sensitivities of some. The intention, however, is not to deny the meaning of orthodoxy, understood as a proclamation of and reflection on statements considered to be true. Rather, the goal is to balance and even to reject the primacy and almost exclusiveness which doctrine has enjoyed in Christian life and above all to modify the emphasis, often obsessive, upon the attainment of an orthodoxy which is often nothing more than fidelity to an obsolete tradition or a debatable interpretation. In a more positive vein, the intention is to recognize the work and importance of concrete behavior, of deeds, of action, of praxis in the Christan life. 'And this, it seems to me, has been the greatest transformation which has taken lace in Christian conception of existence,' said Edward Schillebeeckx in an interview. 'It is evident that thought is also necessary for action. But the Church for centuries devoted its attention to formulating truths and meanwhile did almost nothing to better the world. in other words, the Church focused on orthodoxy and left orthopraxis in the hands of nonmembers and nonbelievers'"
I supposed to be working on my carbon footprint. What with global warming, emissions control, gas prices and lots of other issues to consider. But--and you gotta hear me here--I love cars! This is a confession everyone who knows me understands. For example: Any takers for this Chevy? The company, n2a Motors, is planning a production run of about 100 vehicles. This baby sits on a Corvette C6 chassis, front styled like a '57 Chevy (classic), side like a '58 (transitional year to the two-headlight look), rear like a '59 (wings and outer space!). You can own this two-seater for a cool $135K. Poverty, hunger, mounting need around our world. I'm committed, I tell you, I really am. And, just here I am not joking at all. Obviously, I'll never own a vehicle like this one. So, I suppose this is a confession of my struggle, a plea for intervention, a cry for mercy! God have mercy on my soul! I love cars and the art they bring to life. I mean, this is a work of beauty. Can't you see it? I guess I am just incurably materialistic. Maybe my struggle and my agony have something to do with my birthday being in 1950. What do ya think? Often, people look at our organizational chart ask me questions like, "Why do you have such rich staff resources assigned to places serving relatively few people compared to some other parts of your organization?" Take our children's education efforts among the folks who live at Turner Courts in far South Dallas. We serve fewer than 30 children in our "little" After School Academy. One obvious reason for this is that we just don't have room for any more children, at least not yet. But, we are staff rich, if you are looking only at the number of students involved. What most people overlook is how it is we are working with these 30 children. For one thing, activities offered by the After School Academy are experientially rich and varied--photography, ballet, chess, golf, art, field trips, to name a few of the activities our children are exposed to. And, our efforts at Turner Courts are not just about the after-school hours or the programs offered to the children. Dr. Janet Morrison and her dedicated team work with parents, grandparents, facility staff members, Dallas Housing Authority professionals, community leaders and other residents who don't even have children signed up for our after-school activities. So, we are doing much, much more in the community than the after-school efforts. At this point, I feel a need to draw an important philosophical contrast. If our only concern is to manage programs involving large numbers of people, then our efficiencies could be expected to increase, along with program scale. In addition, our staff-to-participant ratios could improve, from a cost-benefit perspective, and people would stop asking us questions! Of course, if scale was our most important consideration, we would never work in a community like Turner Courts. The physical space limitations alone would cause us to rule out this neighborhood if the number of children involved was are chief concern. But, if our real desire is to play a part--never the only, nor the most important part--in community renewal, our resource mix in a community like Turner Courts always will be rich and complex. In addition, measuring outcomes in such neighborhoods will be more of a challenge. Further, it is important to distinguish between "regional" service efforts and localized, neighborhood efforts. Both approaches are valid and necessary. But, our role in each is very different. For example, our Community Resource Center or Nurture, Knowledge and Nutrition, our summer lunch and reading program, are examples of initiatives designed to serve individuals, families and partner organizations across several counties. Obviously, our After School Academy is all about one neighborhood and one group of children. There is a real difference in the two approaches. It is hard for outsiders or for those who've never been embedded in a community to really understand. In either case, I want to see us come down on the side of improving community vitality every time. Both approaches are valid and needed in Dallas. Talk to Janet. She will gladly tell you about the progress of "her kids" who attend the After School Academy. She may even mention the fact that last semester 23 students who had come through her program in the past were enrolled in college. But, listen longer and you'll hear her talking about parents who are more engaged and committed to their children's education, parents who are enrolling in college themselves, parents who have gone back to work. She may even talk about neighborhood safety, crime statistics and nutrition education. The stories go way beyond our after-school activities and the children who eagerly attend. It always works this way when we find ourselves involved in community building partnerships. Some of our approaches involve hundreds of people and families. Others focus on relatively small groups. As long as we remain true to our values and our operating philosophy, both are needed, very different and always valid. The Commonwealth Fund 2006 Health Care Quality Survey reports something we've known and seen for a number of years here at Central Dallas Ministries. Patients who enjoy the services of a "medical home" do much better than those patients who rely upon other sorts of medical providers for their care. By "medical home" we mean a health care setting where patients receive "timely, well-organized care," including routine preventive screenings, and management of chronic conditions. You know, the kind of doctor's office most of us grew up with! When patients have access to such a medical setting, guess what happens? They are cared for appropriately! What is most encouraging is the fact that racial and ethnic disparities in access and quality are dramatically reduced and even eliminated in such settings. The report documents the fact that when minority patients have a "medical home," they get the care they need. In fact, the numbers are the same for white, black and Hispanic patients. Here's another finding that will likely cause you to say or think, "Duh!" Patients who receive patient reminders for check ups report an increase in screenings for cholesterol, breast cancer, and prostate cancer. In the context of a "medical home," minority patients are just as likely as white patients to receive these reminders, which drive up the number of patients receiving routine, preventive screenings. Patients who lack health insurance, but who have a "medical home," receive preventive care reminders at the same rate as the fully insured. Forty-three percent of Latino patients report that they have no regular doctor or setting for care. A little over one in five African Americans have no "medical home." Patients who have a "medical home" are able to manage their chronic conditions better than those who do not have such a health care venue. Patients who use public health facilities are less likely to encounter a "medical home" environment in those settings--only 21% of these patients reported receiving care in such venues that would qualify them as a "medical home." Only 27% of all Americans (ages 18 to 64) report having all four indicators of a "medical home"--a regular doctor or source of care; no difficulty contacting a provider by phone; no difficulty getting care or advice after office hours or on weekends; and doctor's visits that are well-organized and running on time. Not surprisingly, the uninsured are the least likely to enjoy the benefits of a "medical home"--only 16%, while 45% do not have even a regular source of care. The report makes it clear that all health care providers should take steps to turn existing points of care into legitimate "medical homes" for their patients. Over the past ten years we have been taking steps to create a "medical home" for everyone who comes seeking care from our Community Health Services division of CDM. 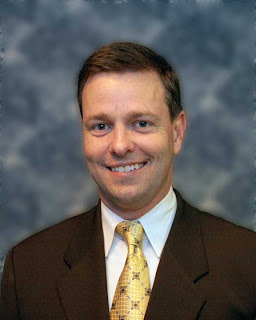 We are most grateful for the leadership of Dr. Jim Walton, Chief Health Equity Officer for the Baylor Health Care System and for the partnership we enjoy with Baylor and with Health Texas Provider Network, the physicians' group supporting the Baylor system. Our efforts at CHS are designed to provide consistent, efficient, high-touch care for everyone who comes to our community practice. As a result, we have transitioned from a "walk-in," M.A.S.H.-type medical unit to a family practice, appointment clinic, complete with health screenings, a full-service pharmacy and doctors who know and care for their patients. On top of this, Dr. Walton even makes routine, weekly house calls! Reading research that confirms our operating philosophy is encouraging. Our patients are very "poor" in terms of their economic status. To our medical team they are cherished friends who deserve the very best of care. 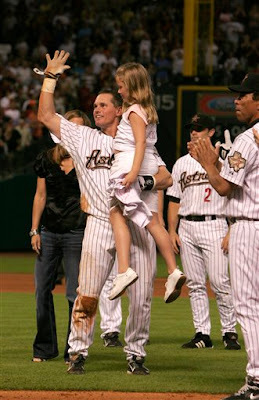 In a game against the Colorado Rockies, on June 28, 2007, Houston Astros' Craig Biggio became the 27th player in Major League Baseball history to pound out his 3,000 career hit. The record hit came in the 7th inning of the game. 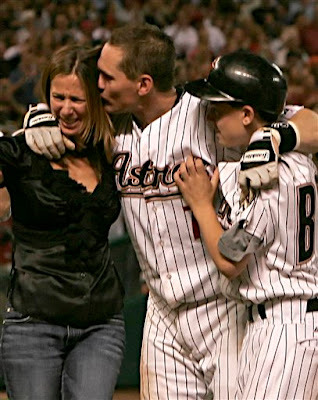 What caught my attention after his major accomplishment was a dugout photo, published in ESPN Magazine (July 16, 2007, page 20), of Biggio kissing his son, Conor, who serves as an Astros' batboy. I haven't been able to find that particular shot online. It is a classic. 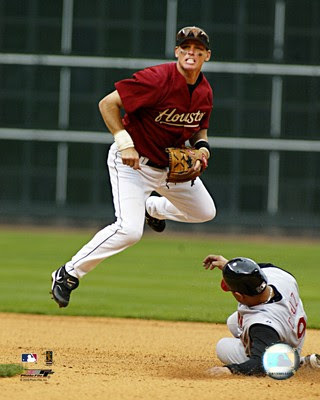 Biggio has always been a great player with lots of heart, hustle and class, at least in my opinion. But, photos following his 3,000th hit made it very clear that he enjoys a powerful relationship with his family. Conor; his daughter, Quinn; and his wife are all involved at the moment of his triumph. The photos included here, all shot by AP photographer David J. Phillip, document the sort of dad Biggio tries to be. One thing I've learned in every community where I've lived and worked: kids need dads who care and who aren't afraid to make their love, care, commitment and concern known again and again. . . to the child. But, it goes beyond the family. Communities need fathers who care and who love their kids. Need some proof? Ask a teacher or a police officer or a retailer or a community organizer. Community health depends on strong fathers. The nature of the geography or the demographics doesn't much matter. The needs and effects are the same. Dads who love their families are prerequisite for thriving communities. I suppose I am so sensitive to this reality because I've seen and known so many children and so many communities whose dads have let them down. The reasons are important, and sometimes complex, often sad or maddening. But, the reasons don't matter much right here. Dads need to step up the plate. They need to stay in the game. They cannot quit. When committed to the joy of loving their kids, fathers will be champs with outcomes much more significant than 3,000 career major league hits! What we're talking here is "hall of fame" performance. . .day-by-day. If I had a magic wand. . .
Let me share a dream or two. If I could direct the funding--and it would take a major public /private commitment to accomplish what I am about to suggest, I would base the redevelopment of South Dallas on a complete renewal of Fair Park. 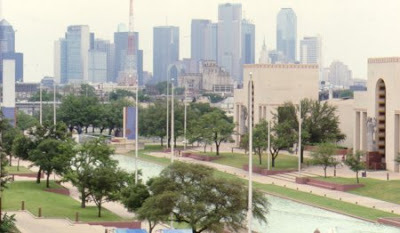 Fair Park is an historic jewel nestled in the northwest edge of South Dallas. Beyond the Music Hall and the various museums, Fair Park springs to life once each year to host The State Fair of Texas. During that three week period, the park hosts the Grambling-Prairie View A & M and Texas-Oklahoma football classics. Everyone loves the fair. 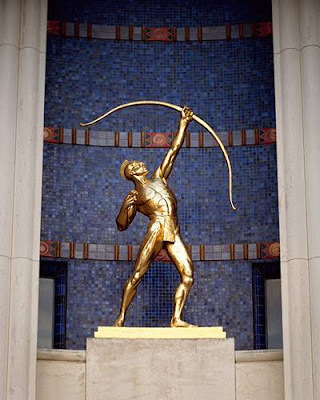 But, Fair Park could be so very much more than it is today. Shame on us for not taking advantage of this unique community asset. 1) Bring a Major League Baseball club out of the National League to Dallas and locate it in Fair Park. My first choice would be to move the Pittsburgh Pirates Baseball Club to Dallas. Of course, there's not enough magic in any wand ever made to pull that one off. So, as a second choice, I'd move the Tampa Bay Devil Rays to the National League, which would mean the Washington Nationals would need to join the American League East. No easy change, but not impossible with the right wand. There are a number of potential owners in Dallas. Or, maybe we could create a very unique franchise that was owned, at least in part, by the public. The Metroplex could support two major league teams. The competition with Arlington would be fun to watch! 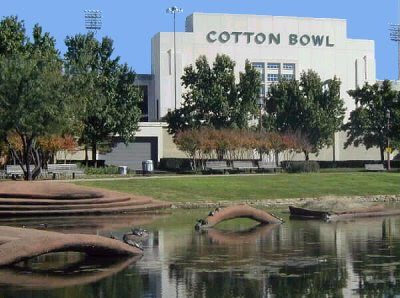 2) Build a wonderful new Cotton Bowl. The stadium I have in mind could easily host football games, including the annual fall, State Fair Classics and other special games. I can see Notre Dame playing Arkansas or Texas A & M. Or, how about a USC--LSU match up? We could host two or three special games annually, drawing from any of the major college teams. During baseball season (remember now, that would be 81 home dates, not counting college baseball! ), our new team, let's say the Dallas Knights, would play in our new state-of-the-art sports facility, complete with retractible roof system that would make our summers bearable for pitchers. Lots of new jobs, year-round positions, would be created by a baseball venue that could accommodate other sports. Baseball is always better for communities that seek real economic development because of the number of guaranteed dates for the venue. 3) Redevelop mixed income housing on much of the extra parking area that was needlessly claimed years ago from neighbors who weren't consulted, but who were displaced. Town home condos, moderate and larger single family homes, mixed income/mixed use multi-family housing and retail development would be included around the park. 4) Renew the Martin Luther King, Jr. corridor by providing economic development funds to existing business owners and meaningful inducements to new, larger retail outlets. This key corridor out of Fair Park should be a major part of "Downtown South Dallas." 5) Redevelop all of Second Avenue as a shopping, dining, entertainment district to go along with the stadium renewal. This other corridor of the community could become a bustling center of economic and entertainment health. 6) Make sure that Dallas Area Rapid Transit (DART) developed adequate light rail transportation services to and from Fair Park and down the new development zones. A rail plan linking Fair Park to Deep Ellum, Downtown, and Uptown would be amazing. 7) Coordinate with the City of Dallas a new, aggressive land bank strategy to build out every vacant lot in the area as part of a dramatic, creative in-fill housing initiative. A plan should be devised to bring non-profit and for-profit developers to this important community challenge. The foundation community in Dallas should join with the city in creating a genuine and very robust housing trust fund that could create thousands of new home owners to take advantage of the in-fill housing redevelopment plans. 8) Appoint a special director or "Czar" for Fair Park renewal and expansion to drive the effort every day until it is completed. This special leader would need to be trusted, reputable, visionary and totally committed. He or she would then need to be surrounded by other community leaders who would drive the project forward. 9) Complete the entire project by 2015. What would it take? Public and political will. A champion who lives and breathes the vision. Private investment. Community involvement, and by that I mean the folks who live around Fair Park would have to be involved in an official and meaningful manner from the beginning. The entire city would need to be sold on the fact that a success in South Dallas would benefit everyone. And what a difference this would make for the entire city and region. And, just think, a team with pitchers who take their own place in the batting order! Several years ago I attended a "National Day of Prayer" breakfast event here in Dallas. The keynote speaker for the morning was, then mayor, Ron Kirk. I remember noticing the mayor as he entered the hall. He wore his familiar bright smile and he greeted people already seated at tables, as well as those standing visiting with one another. He carried a black Bible in his hand. When it came time for Mayor Kirk to speak, he stood before the crowd and looked us all over. His opening line was unforgettable. "I realize this is a prayer breakfast and I didn't come here to cause a problem," he began. "But, you know what I think?" He paused to let us think for a moment. "I think we've prayed long enough in this city! It is past time for us to go to work changing things for the better!" Kirk went on to challenge us about the pressing issues facing Dallas, including a number of concerns he shared about the poor and the weak among us. I don't remember the details, but I'll likely always remember his opening challenge to us--we who were, and remain, so religious, so full of faith and so ineffective in really bringing about community transformation. The Mayor's words remind me of Gustavo Gutierrez, the father of Liberation Theology in Latin America. For Gutierrez, as for Kirk, faith doesn't matter if it is not connected to the streets of a community. Faith is about how we relate to and engage other human beings, how we work together to make things better, more just and more open to the possibilities of peace and community. Faith that does not embrace the pain of world is really no faith at all. ". . .charity has been fruitfully rediscovered as the center of the Christian life. This has led to a more Biblical view of the faith as an act of trust, a going out of one's self, a commitment to God and neighbor, a relationship with others. It is in this sense that St. Paul tells us that faith works through charity: love is the nourishment and the fullness of faith, the gift of one's self to the Other, and invariably to others. This is the foundation of the praxis of Christians, of their active presence in history. According to the Bible, faith is the total human response to God, who saves through love. In this light, the understanding of faith appears as the understanding not of the simple affirmation--almost memorization--of truths, but of a commitment, an overall attitude, a particular posture toward life" (A Theology of Liberation, page 6). I think this was the mayor's point. We've had enough prayer in this town--we're way "long" on prayer. We've got churches on every corner! What we need is some action motivated by faith and love. You know, the kind that doesn't mind getting the dirt of the street under its fingernails. Across the years, people have given me strange looks when I confess that my faith has been shaped significantly by reading liberation theology. I do what I do in large part because of what I have discovered while exploring this very rich school of thought. Years ago, while in seminary, I enjoyed the good fortune of sitting in a summer school class with Dr. James Cone from Union Theological Seminary in New York City. Cone's course, Black Liberation Theology, provided me with hope, courage and even healing. I found him even more amazing in person than in print, which is saying a lot! I suppose what I find most attractive about the thought of writers like Cone and Gustavo Gutierrez is the fact that everything is rooted deeply in the here-and-now. Action in the real world is the key to every expression of faith. Instead of becoming lost in the past or distracted by a future that will be experienced on a completely different plane of existence, thinkers like Gutierrez and Cone keep calling me back to the street and its reality. In a system of thought like this, it becomes almost impossible for middle class types like me to rationalize my failure to engage the pain, injustice, suffering and oppression of my world. My responsibility in this day happens to be this world or, better, that part of the world where I will find myself living today. There is not much time for dwelling on the past, except as precursor for the present that is currently "in my face." There is little reason to focus much on the future, it will take care of itself. My call is to live and to act in faith for the transformation of the world as I find it. Liberation thought demands an entering into the life of the world. To put it theologically, it calls for radical incarnation. I must enter the pain and the struggle of this world for the sake of and alongside the poor, the marginalized and the oppressed. There is no way to heaven but through the earth. My responsibility is the life and the world in which I find myself. In community with others, I am called to live out my faith from a street level perspective. The old hymn, "This World Is Not My Home," might be true; but this world is without a doubt my current assignment, it is where I am rooted by faith, and I dare not "pass through" without thought, sacrifice and focused attention. It is what I have been given and called to engage. Maintaining this very real, practical and "down-to-earth" focus keeps me on track. And, in this regard, I find reading Cone, Gutierrez and other liberationists to be most helpful. They bring my faith to life and into my world. July 7, 2007. . .7-7-7. Around the world today people in every nation are thinking about the earth's environment, the challenges presented by climate change and moving toward more "green living." 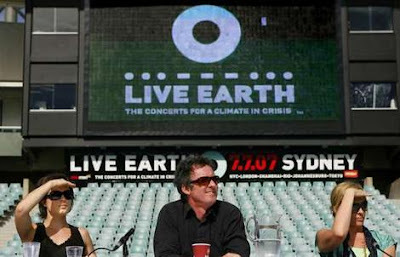 Live Earth: The Concerts For A Climate in Crisis provides the music from around the world, including venues in New York City and Washington, DC. 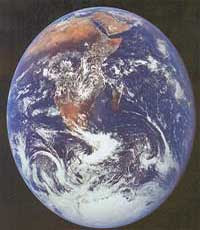 You can check it out at: http://www.liveearth.msn.com/about/factsheet?GT1=10227. Caring for our neighborhoods, our communities and our neighbors will naturally lead us to be concerned for the entire planet and for neighbors around the world. The same concern extends to our children, our grandchildren and their children. 7-7-7. . .a time to think things through. . .and sing along! Native American wisdom heard today during Live Earth on the Washington Mall by the Smithsonian's National Museum of the American Indian: "Every decision should be made with the seventh generation in mind." Understanding what our nation's 9 million children and their families face because they lack health insurance coverage is essential to any meaningful progress on the issue. At Central Dallas Ministries, we see children who fall into this category every day. "Children's Defense Fund's Take" http://abcnews.go.com/Video/playerIndex?id=3240814. Did I say already that we must do better? A neighborhood battles all of the challenges and negative forces associated with poverty--urban decay, declining population, crime, drug abuse and trafficking, low performing schools, various public health epidemics, little or no viable economic infrastructure and, thus, few employment opportunities. Despair thrives here. A neighborhood needs a new start, complete with decent housing, new economic development and strategies for improving every aspect of the social infrastructure. Steps toward improved health outcomes, quality retail grocery options and new employment options should be taken as quickly as possible. Unfortunately, the overwhelming list of negatives blocks the entrance of the needed positives that would contribute to neighborhood renewal. Somehow the logjam must be broken up. Enter committed partners drawn from several sectors. "Committed"--this won't be easy, the work of community renewal. Players must be determined to stay in the game for the long haul, no exceptions no matter what. There will be no quick fix. This is where we must begin. "Partners"--every one who comes to the table must decide to leave something on the table; some real resource with discernible market value. Soft or hard, the contributions must be real and they should be sacrificial. "Several sectors"--the partnership must be diverse. No single sector of a community can pull this one off alone. Public players from the city, county and state must be involved. Community leaders out of the grassroots tradition must be engaged and trusting. Business partners, including bankers, realtors, developers, retailers and urban planners will have to be present. Non-profit and community-based organizations have an essential role to play in the process. Health care providers must be involved. Church and others from faith communities will be needed. Often, these same critics will try to reduce the community effort to a focus on individuals alone by stressing individual change as more important than community or neighborhood transformation. No doubt, individuals must and will change whenever communities experience renewal. But, we've learned that it will be group transformation that speeds along individual betterment and not the reverse. Like I say, be prepared for battle and don't be surprised, just endure! My only point here is this: if the right partnerships are constructed, change can happen. Neighborhoods don't have to be held hostage by the pessimistic thinking that too often dominates our understandings of low-income communities. Hard work, very hard work; determination, faith and commitment to a collective effort can bring about change. Church of "the back on track"